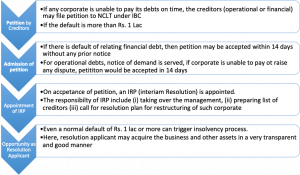 The Insolvency and Bankruptcy Code, 2016 (“IBC”) was enacted with the objective of reorganization and insolvency resolution of corporate persons who is unable to pay its debts in a time-bound manner. Maximization of the value of assets of corporate persons. The balance of interests of all the stakeholders. What is a resolution plan – Resolution plan means a plan proposed by a resolution applicant for insolvency resolution of the corporate debtor a going concern. After the invitation by the IRP, any person who is eligible under IBC can submit a resolution plan and become a resolution applicant. The resolution plan has to be prepared on the basis of the information memorandum. A) Acquisition of business – if any person is looking to take over a certain business, then this is the opportunity for them, whereby just submitting a viable resolution plan they can take over the business which is running and having a complete system in place. B) Piercing into a new domain – if any business is looking to enter into a new domain or new operations, then it is easy for them. That person has to just submit a resolution plan before the Resolution Professional and if it gets accepted then it will become easy for that business to enter into such a new domain. C) Promotion of entrepreneurship:- by becoming a resolution applicant, entering into business is easy. Rather than starting from the scratch it will become easier for the new entrants to just invest a small amount and acquire the business which has the potential in the future. D) Comparative low cost :- Once the company goes under Insolvency, its goodwill value and even the prices of some items get affected by market sentiments. Further, there are certain intangible assets associated with every company which loses its value during the resolution process. Due to such points, the price which is for resolution proposal is much less than the price asked by such party if it would not be under insolvency. E) Better understanding with creditors and stakeholder – The resolution proposal is approved by committee of creditors, which implies that it would give an understanding with the creditors for future.